Twin Peaks: A Reaction | Phil-zine! I’m hyperventilating right now, my finger and toes are literally tingling. I was weeping on the floor of my bathroom a few minutes ago, my cat freaking out because I was, listening to the voice of my friend and making no sense to her. See, I had to text my friend Chase, who I thought might understand, and after a few bewildering texts she called my to see if I was okay. My voice was shaking. My voice trembling. I cried when I talked about the final moment of Twin Peaks, I couldn’t finish my sentence, it was overwhelming, I’m crying now. Tears streaking down my face. I can’t begin to describe my feeling or my state of being other than that I’m not here right now. I’m somewhere in my subconscious; so forgive me if this is all very stream of conscious. Since the beginning of the first episode I connected with the character of Dale Cooper, in a way I suppose I didn’t even expect at the time. I remember having a natural affinity that I couldn’t explain. Like I was at the end of the story at the beginning. Like I remembered where it would go but I didn’t know. 1999 the night of the millennium. I fell asleep just after midnight. It was a beautiful night. People over use that word, “beautiful”, until it has no real meaning. Pretend like it’s the first time you’ve ever heard it and you’ll know what I mean. We went swing dancing. I had maybe a drink. I was happy, content, as Cooper first came to Twin Peaks. Probably the most content I’ve ever been in my life. I don’t remember thinking anything in particular one way or the other about anything. There was no turmoil. No pain. No happiness even. It was this euphoric feeling, like I’ve never felt before. Light. I wasn’t in love. I wasn’t. I wasn’t in love. I was content with the universe and everything in it; everything had it’s place and I had mine. I fell asleep, as if the next day would hold no problems. Like my future was a path that was light, that wasn’t empty or lonely; that love was enough. I woke up at about 3am and I could feel the universe stretching out before me. I felt like what it might be like to try and understand eternity, infinity, and as everything expanded, the walls of the room felt like they were caving in on me and crushing me. This feeling of vast space and claustrophobia at the same time. Being stretched and contained in the tiniest box. I wasn’t asleep. My hands were shaking violently, I can’t remember if I was crying or not, I was hyperventilating. It was a blur. I stumbled out of bed into the hallway. It expanded before me, behind me, the floor wasn’t there. I knew it was all in my head, but I couldn’t stop it. I pounded my head on the wall to try and get it to stop. Trying to make this feeling of falling over the precipice, this fear, this thing I couldn’t understand — trying to beat it out of my head. It was the most horrible fear I’ve ever experienced. The fear of having the knowledge of something in your brain that no matter how hard you tried you couldn’t understand. And experience this fear on an emotional, psychological, and physical level all at once. Something in your head you maybe weren’t meant to understand. And I fell to the floor and curled up. I feel like my words aren’t doing my experience justice. Time sped up and slowed down at once. Then for three weeks I couldn’t sleep – I didn’t really want to. I had minor panic attacks through out the day. Glimpses into black holes, into eternity. They didn’t make sense. I left my house immediately that night and went to my friend’s place, who was out of town and got a few minutes of sleep on his couch. Beds felt too abstract to me. It’s like everything that was common or normal couldn’t be trusted. That there was something hidden just under the surface. For three weeks this lasted. And on occasion over the past few years I’ve awoke in the middle of the night in a panic from a dream that I cannot remember. My dreams, I will add right now, are almost too life like. I have very strong emotional responses to the intricate worlds I create while I’m asleep. That I’ve never remembered this dream, can only tell me that I’m hiding something up there. I talk about things hiding just beneath the surface, about dreams feeling so real that they affect you and show how to deal with things in your life. 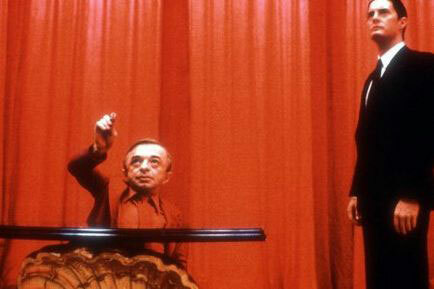 In Twin Peaks this was the world, it was my world. I was Dale Cooper. Over the past several weeks “embrace uncertainty” has become a motto of mine. I’ve always been good at being fearless when moving forward, but I’ve never been able to do it as quickly as I’ve wanted. That’s a lie. I chase things I know I cannot attain. I step forward directed at things that I know won’t work. I struggle before taking that step into uncertainty, because I’m afraid that there’s something in me, that I’ve seen in these dreams. Things I don’t like. It’s a part of me that exists within me. Watching the final episode of Twin Peaks, seeing Dale Cooper step into this world of uncertainty and ending up where he did when he returned, made me feel exactly like I did that night when I woke up from my slumber. I felt it welling up inside of me. And I couldn’t stop it. The episode dug back into my subconscious somewhere where this switch is at and hit it hard. I understood it in a way that I don’t think I understand it. I just realized I’m intermittently holding my breath while I type and pause to gather my thoughts, and though the light is on, it feels dark. I saw the mirror of what I’m capable of becoming, of what perhaps everyone is. Because if I can, then anyone can. And then love isn’t enough. I’ve stood on that precipice before and haven’t stepped in and these last few weeks I’ve been telling myself to embrace that uncertainty, no matter where it may take you. I’ve been to some dark places in my life. Are all of those signs good or bad…I don’t know. Will I end up in the same place Dale Cooper did, maybe. It’s a fear of mine that nothing I do will matter. Or that I won’t matter to anyone. What I fear most is that I will be the person to bring that about, in the process of trying to do what’s right. I texted my friend Chase during the attack, because I didn’t understand what was happening to me. After a few exchanged texts, she called me. I couldn’t really put it into words, but when I spoke of the final moment with Cooper, I began to weep again. Not just crying. Crying comes from the chest. Weeping comes from the gut, from the brain. I can feel my senses returning and the words are making sense. I didn’t want that. I wanted to stay here for awhile, to see if I could make more sense of it, but the feeling is drifting away. I will need to watch this episode again tomorrow. One thing that this series and especially the final episode reminds me of is that I need to affect people, to the core with my work. My acting, my writing, my directing…whatever I do. If it doesn’t touch someone as the movies and stories I see touch me, then what’s the point of doing it? This entry was posted on August 17, 2010 at 7:59 am and is filed under Film, Uncategorized. You can follow any responses to this entry through the RSS 2.0 feed. You can leave a response, or trackback from your own site.